In New England, a classic Land Cruiser brings its striking color combination and iconic style to the shoreline. Cloaked in the same steel armor it's worn for decades, this classic green machine is ready to ride! Today when we hear about green cars, electric vehicles or plug-in hybrids immediately come to mind. 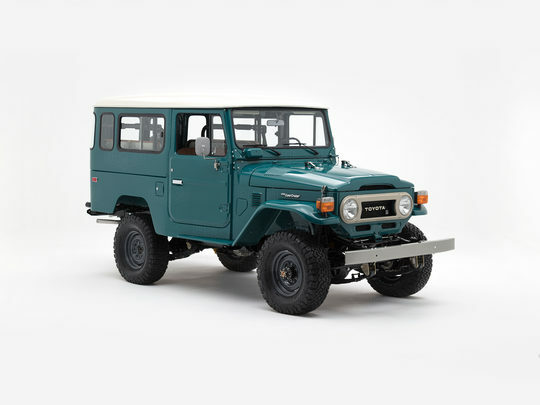 But back when this beast was born, green (or Rustic Green 621, if you speak Land Cruiser) was simply a color — one that looks just right on this FJ43's authentic steel body. Perfected and repainted, this Land Cruiser abounds with classic details like exposed bolts, Toyota steel wheels (No hubcaps! ), and classic headlights. It's an iconic design with sharp lines, exposed bolts, and heavy rubber — leaving no doubt the legend is back! The Toyota 2F engine is known for its classic feel, reliability, and toughness. And here, a good thing was made even better with a Toyota 5-speed transmission, making it one smooth operator. Four-wheel drive components were completely rebuilt, and we upgraded to Old Man Emu suspension and Advanced Power Steering - essentials that stay true to the spirit of the classic Land Cruiser and instill driver confidence on just about any terrain. Get behind the wheel of this FJ43, and you'll feel that aura of nostalgia wash over you - the kind that reminds you of the craftsmanship of the past and a commitment to something better. Here, exposed steel and brown vinyl combine to create a classic look, accentuated with modern technology. Vintage-looking controls support modern functionality, keeping your ideal cabin temperature and favorite tunes within reach.